Prevailing wisdom holds that upstream efficiencies cause downstream bottlenecks. Yet perceptions regarding bottlenecks, their sources, and how to deal with them differ widely. Downstream bottlenecks can occur at any step, particularly at innately slow steps like chromatography, or where pooling or hold-up are involved. Virus removal or inactivation, filtration, and cleaning/sanitization steps can all introduce slowdowns in the overall process. “But it’s clear that chromatography is the place to look to improve productivity,” says Margit Holzer, Ph.D., R&D director in the process division at Novasep. According to Eric Langer, president of BioPlan Associates, most biomanufacturers report some degree of downstream capacity bottlenecks, particularly with chromatography. BioPlan’s recent survey of biopharmaceutical manufacturing, suggests that nearly twice as many companies do not experience bottlenecks at all (20.5%) as encounter “serious bottlenecks” (11.8%). Those who don’t experience bottlenecks have either optimized their process or are not producing mAbs. “Biomanufacturers who expect significant bottlenecks in the future may be experiencing greater upstream output, which must now be purified using current capacity,” Langer explains. Yet over the four-year study period, chromatography and depth filtration are contributing less and less to downstream bottlenecking compared with the year before. Protein A capture is a source of ongoing complaint. Despite three- to fourfold improvements in dynamic binding capacity, protein A is about ten times as costly as ion-exchange resin. While the jury is still out on replacements for protein A, one technique, simulated moving bed (SMB) chromatography, is a way of exploiting protein A’s binding capacity to its near-theoretical maximum. Instead of using one large column whose binding is exploited to only about 60%, SMB uses several smaller columns in series. As one column fills to absolute capacity it is taken off-line, washed, eluted, regenerated, and placed back into the queue. Many companies have variations on this theme. Novasep’s is called BioSC Sequential Multicolumn Chromatography. “SMB and continuous chromatography optimizes a separation in the third dimension, which is time,” notes Dr. Holzer. Novasep says that its sequential multicolumn chromatography system, BioSC, fully exploits dynamic binding capacity of high-value resins. Uwe Gottschalk, Ph.D., vp for purification technologies at Sartorius Stedim Biotech, reduces the causes of downstream bottlenecking to four T’s: talent, technology, throughput, and time. Downstream talent has been depleted over the years, he says, because drug developers sought to solve all their problems through genetic engineering. Today, processing expertise is blossoming at universities, but industry still lags behind in re-acquiring that expertise. Time relates to biotech’s full pipelines and the ability to schedule production within time constraints given the capabilities of plants designed five or ten years ago. Operational excellence strategies like lean and six sigma have done a fair job of reducing bottlenecks, as have approaches like quality by design and process analytics. These were slow to arrive at biotech firms, Dr. Gottschalk says, because they weren’t originally needed. The industry is much better off today because these strategies drive down cost, improve quality, and provide (at least the equivalent of) higher capacity. But operational excellence has a physical limit. Achieving above and beyond that requires innovation. Dr. Gottschalk sees stagnation or inertia at some larger companies, and the danger that they may no longer lead the industry in manufacturing innovation. In turn this creates opportunities for smaller firms starting from scratch, particularly in Asia, to adopt downstream innovations. These include replacements for protein A capture like cation exchange and nonchromatographic techniques such as precipitation, extraction, and nanoparticles. Günter Jagschies, Ph.D., at GE Healthcare, has long been outspoken in debunking the notion that upstream efficiencies unduly stress protein purification, that the problems are intractable, and the solution lies, at least in part, on alternative technologies. Dr. Jagschies does not deny upstream-downstream mismatches. But those, he says, are more a function of when a bioproduction plant was put into service than of inherent inabilities to deal with high titers. He admits that plants coming online today were designed for lower-titer processes conceived between five and ten years ago, and that purification has not improved step-for-step with cell culture. “But if you were to start from a blank slate, if you could build plants today based on modern purification technology, bottleneck issues would not arise,” he says. Plants constructed in the early 2000’s were designed for protein titers below 1 g/L. Processors can make up for approximately a doubling of titers without changing much. Once a process crosses the 2–3 g/L titer level, however, operators must adopt newer, higher-capacity, and higher-throughput filtration and chromatography tools, as well as modern dilution, buffer, hold, analytic, and scheduling strategies. Besides, the perception of gross mismatch depends on the point of reckoning. By comparison today’s processes are at least 100 times more product-intensive than the first bioprocesses, but only 10 times as product-dense as the first monoclonal antibody processes. Relatively straightforward adjustments in purification technology, he says, can open up low-titer facilities to high-titer processes, without adding or eliminating unit operations. One such improvement is switching to high-performance resins providing three to four times the binding capacity and significantly higher throughput than first-generation resins. Moreover, when crossing the magical 2–3 g/L barrier, processors can analyze the entire process and implement changes at once to chromatography, filtration, buffer, and hold steps. Most observers believe, however, that this is more easily recommended than done. Many observers, though, now view upstream titer improvements as something of a mixed blessing. 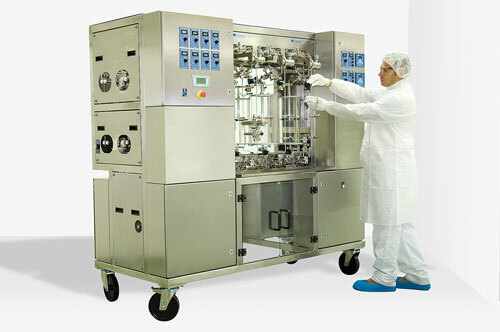 In manufacturing, more is usually better than less, but that is not always true for the manufacture of biotech drugs. “If you plot a U-shaped cost curve, with the x-axis as product titer, you’ll see that it flattens out between three and five grams per liter,” Dr. Jagschies says. That rising titers also raise the cost of goods flies in the face of conventional wisdom, but the logic is irrefutable. Bioprocessors experiencing rising titers can exploit newly found efficiencies by running fewer batches or making more product. The latter is only viable if demand exists for the drug. Reducing the number of campaigns sounds attractive, but it is only cost-effective if the freed-up capacity can be filled with some other remunerative project. “But almost nobody is operating at full capacity,” Dr. Jagschies observes. Genentech and Amgen, for example, are divesting themselves of capacity. In the hypothetical case where two batches produce the same as three, fixed costs—which comprise up to 70% of all costs in classic stainless steel facilities—are apportioned to one-third fewer batches, which raises their nominal cost; the variable cost advantages from running one less batch pales in significance. Instead of throwing R&D competence toward wringing out the last bit of production efficiency, Dr. Jagschies suggests devoting those resources toward higher-quality product. Reducing aggregates and improving drug potency are two such strategies. With material needs greatly reduced, biomanufacturers will become much more savvy about dimensioning future production facilities. Despite the fact that downstream technology is out there and regulators are more open to it than ever, most processors are reluctant to deploy an entirely new process. For them, incremental improvements are more comfortable and familiar. Dave Wareheim, subject matter expert in biotechnology at Integrated Project Services, believes that streamlining downstream processes can be achieved without significant changes to individual unit operations. Wareheim has worked with GE Healthcare on a system for adjusting pH in-line between columns, for example between capture and ion exchange. The technique works with bind-elute/bind-elute as well as bind-elute followed by flow-through chromatography. “It eliminates a collection vessel dedicated to pH adjustment,” Wareheim says. A second, related technique involves in-line buffer mixing directly in front of the chromatography skid, which reduces buffer storage volumes. Warheim has co-invented (and applied for a patent on) a method linking chromatography and filtration steps directly, with no hold step, through in-line buffer dilution. As with any process, the slow step dictates overall throughput, but Wareheim says under optimal conditions throughput may improve up to sixfold. In-line dilution and pH treatment save not only materials and time, but can help avoid costly alterations to a facility to accommodate higher throughput. More complex is the application of SMB chromatography to the capture step, which can reduce costs associated with the “million dollar column.” Wareheim mentioned technology from Tarpon Biosystems, BioSMB™, which claims to outperform conventional chromatography by a factor of five while reducing purification costs by up to 50%. Efficiencies can often be achieved simply by replacing expensive unit operations with much less expensive ones, which may be less risky. The protein A capture step has been a target for cost improvement for a long time. In 2010, Bio-Rad introduced a cation-exchange resin, Nuvia™ S, with a dynamic binding capacity of up to 200 g/L—significantly higher than the best protein A resins available. “A number of companies are actively exploring ways to replace protein A with cation-exchange capture,” says Randy Jacinto, Ph.D., senior product manager. “The question is who will implement it first at large scale.” One of Bio-Rad’s customers has, in fact, done so. The resin lacks the specificity of protein A but provides other benefits, like removing aggregates and the ability to load the column directly from the clarification step. Cationic-exchange resins do not require conditioning, at least on the scale of protein A. Another benefit is price. Nuvia resins cost about $2,000 per liter compared with $12,000 per liter for protein A resins, Dr. Jacinto says. For whatever the reason, and despite opportunities to employ second- and third-generation separations methods, downstream experts continue to lament about bottlenecks. While technologies allowing full utilization of downstream capacity are readily available, one can easily construct economic models that justify staying put. “It is sometimes profitable to revisit the whole purification process, when the regulatory burden is very high”—or perceived to be—“change is perhaps not worth it,” observes Dr. Holzer.